Director and Co Founder, Sri Yoga Studio of Athens, Ohio. Residential Student of Swami Rama of the Himalayas for four years in the late 1970s. Experienced Yoga Teacher (E-RYT 500) with Yoga Alliance. For teachers seeking certification with Yoga Alliance, she can provide contact hours and Continuing Education as a YACEP . 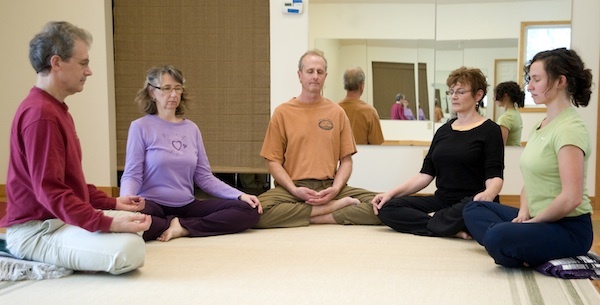 Over 30 years teaching experience in the Himalayan yoga tradition. Ongoing study, at regular intervals with the Himalayan Institute since 1988 in Allahabad and Khajuraho, India as well as the Honesdale, PA campus. Between 2012-2017 she was the Risk Reduction yoga instructor for Well Works, the employee wellness program at Ohio University in Athens, OH. She was trained by the Yoga for Veterans Project in 2017. Specializes in Intermediate and Advanced practices of Himalayan Yoga in our studio including hatha, meditation and private instruction to help with the recovery from trauma to body or mind. Richa loves to help train new teachers and give private sessions in our studio. She is also a Licensed Social Worker through the State of MN, a Registered Acupressurist and Authorized Teacher for the Jin Shin Do Foundation of Bodymind Acupressure and Registered Classical Homeopath with The Council on Classical Homeopathy. Madeleine joined the Ohio University School of Dance faculty in 1980. She retired in 2015 after many years as Director of this program. She is a certified Laban Movement Analyst. A graduate of 200 hour Himalayan Institute Teacher Training, she is a member in good standing with The Himalayan Institute Teacher Association (HITA). She was trained by the Yoga for Veterans Project in 2017. She continues to study at The Himalayan Institute campus in Honesdale, PA at regular intervals. She studied at both the Allahabad and Khajuraho campus for the Himalayan Institute . She specializes in Intermediate classes for the professional athlete, dancer, choreographer and other physically trained professionals.